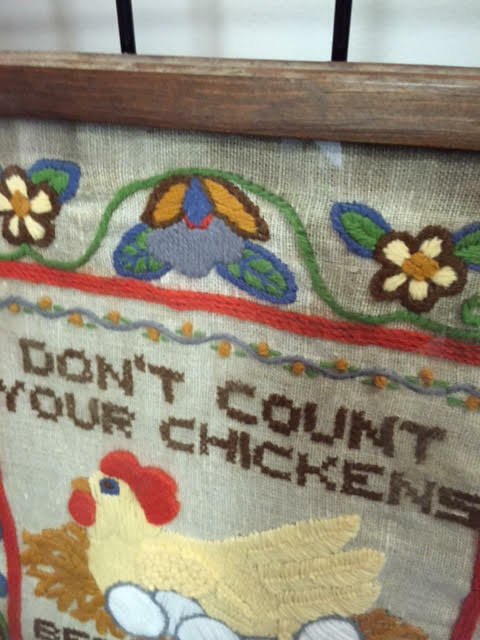 This is a great example of vintage, homey, folk art needlepoint! 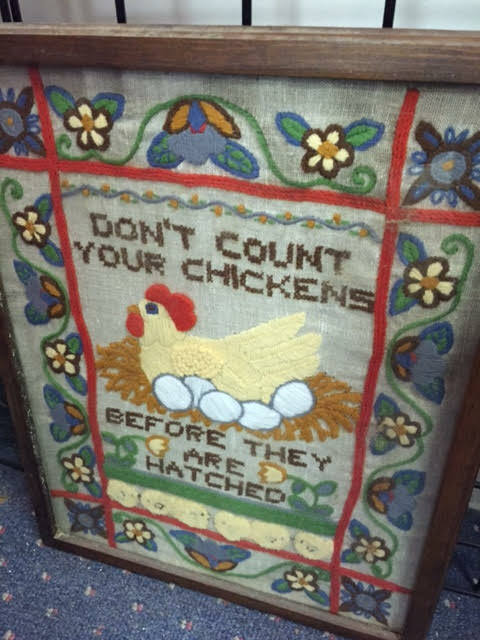 Seriously, can anyone look at this framed rendition of the old saw “Don’t Count Your Chickens Before They’re Hatched” – and NOT smile? Condition: It’s actually in pretty good condition. 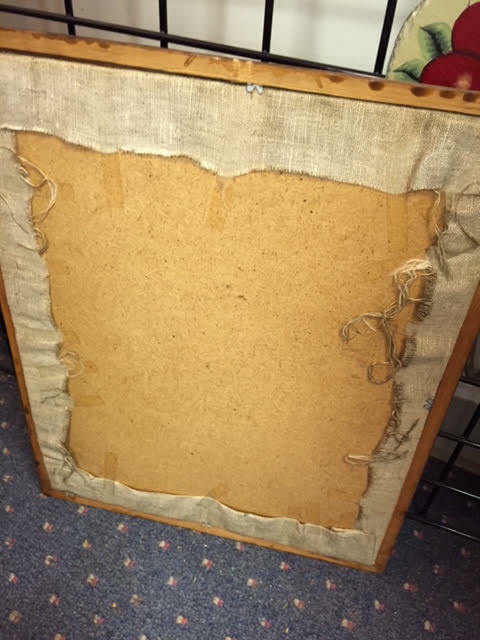 The wood frame is basic, and the back is rather rough (see photo below), and one of the original metal chips holding the needlepoint itself in place is missing (so has been replaced). But overall, it’s a wonderful piece. Dimensions: I’ll have to add the dimensions later but would estimate that it’s about 20″ H x 15″ W.
Price: $24.00 plus 5.5% Maine sales tax. Where To Find This Item: It’s in our booth (#23) at the Hathaway Mill Antique Mall, 10 Water Street, Waterville ME 04901. You can also find us on Facebook at https://www.facebook.com/heritagecollectibles and https://www.facebook.com/groups/heritagecollectibles, as well as on Twitter at https://twitter.com/heritagegifts. 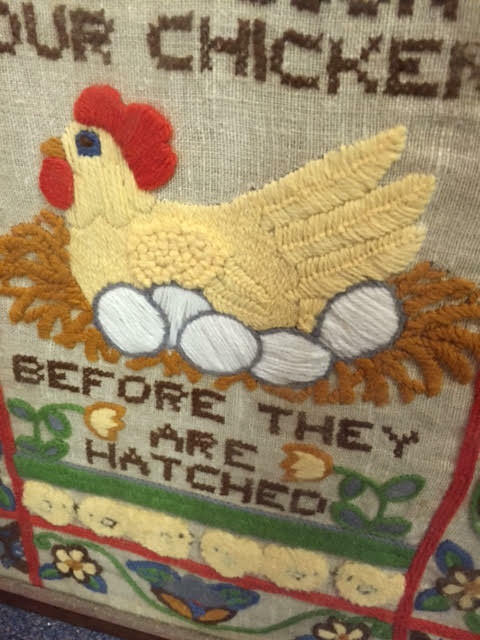 This entry was posted in Art - Folk Art, Primitive & Farmhouse Decor and tagged chicken art, don't count your chickens, folk art, Heritage Collectibles, needlepoint, primitive. Bookmark the permalink.